I am extremely fond of crusts. The char on a perfectly grilled steak. The edges of a meatloaf. The perimeter of a wood-fired pizza. The crunchy topping on bubbly mac and cheese. Stripping a quiche of its casing is not out of the question. And let us not forget the crust of a hot Parisienne baguette. All of these crispy bits throw that whole sharing is caring thing right out the window. Give me my CRUST. And then there is the best crust of all…pie. Buttery. Flaky. The exterior has crunch. 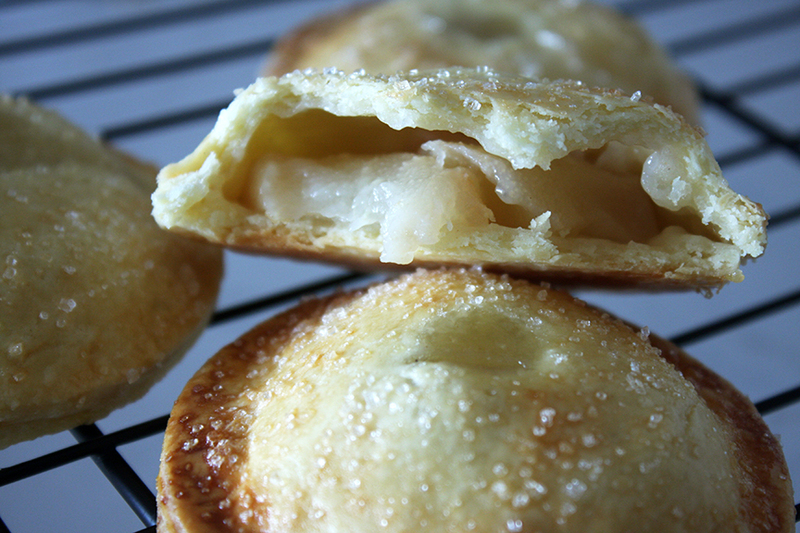 The interior is soaked with gooey pie filling. Screw the pie, bring me a plate of pie filling-glazed pastry crusts. Just cut the edges off an serve it up, with a doily. Cause who doesn’t like a nice doily. To get the maximum crust to filling ratio and limit any risk of having to share said crust, the only solution is hand pies. Individually sized, with a perfectly respectful 60% crust to 40% yummy filling and no fork or plate required. Like a pop tart, but edible. So now you know my possibly unhealthy, but likely unwavering obsession with crust. But what about the filling; that gooey or cheesy or meaty stuff that makes those crusty edges so delicious. Of course the possibilities are endless. But how about we talk about just one of those possibilities: poached pears. Poaching the pears first makes filling a pie with vanilla bean, pears AND white wine possible. Oh, and there are spices too. Good ones. Take these hand pies to work. Shove ’em in your purse. Snack on one when queuing at the bank, or sitting in traffic, or when you’re seriously considering buying a burrito out of a vending machine even though you are fully aware of the debilitating regret (and possible sickness) that will come with that decision. 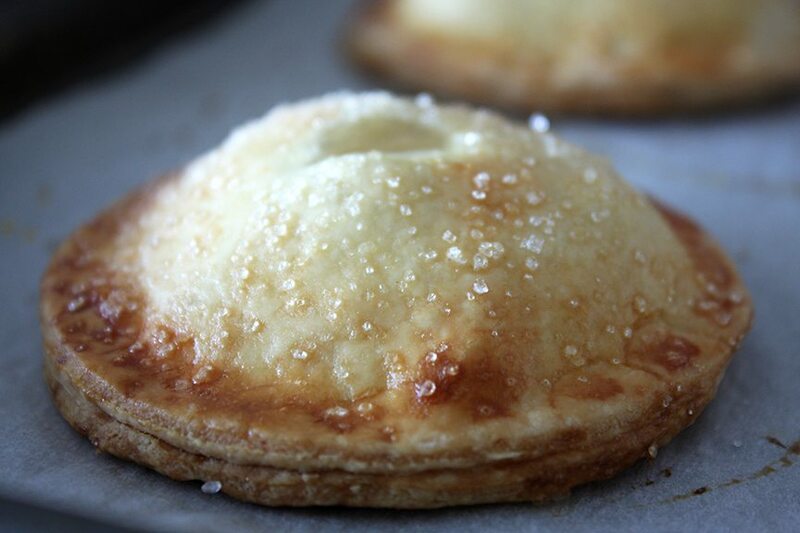 Anytime is a good time for hand pies, and you definitely don’t have to share. Check out step by step photos of this recipe on the Facebook page. 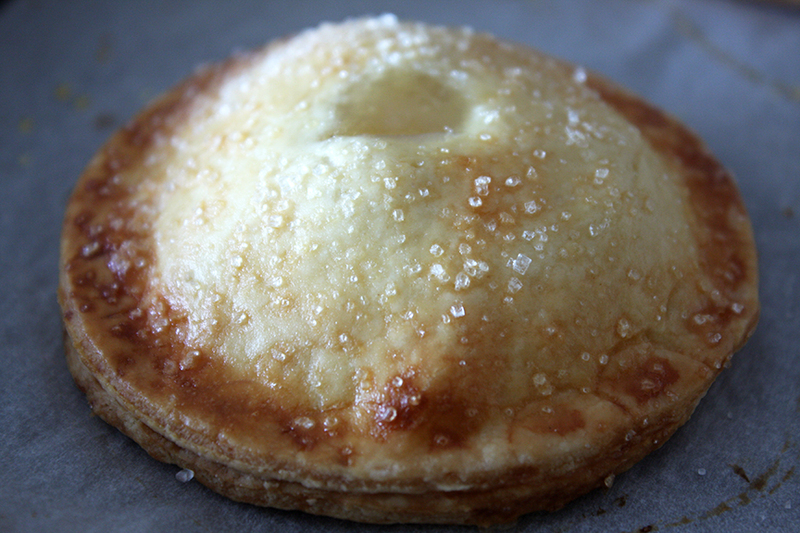 For hand pies, I use circle cutters in two sizes, one being 1/2″ wider than the other. This helps prevent the awful task of stretching dough over the mound of filling, which never ends positively. Also, you can definitely reuse this poaching liquid. Let it cool and store in ziploc bag with all the air removed then freeze. Defrost when ready to use again. In a large bowl, stir together flour, salt and sugar. Using your fingers, pastry cutter or food processor, cut the butter into the flour mixture. I prefer the finger method because I find that the dough becomes flakier when baked and it gives me a better feel for when the dough is ready. Once the mixture resembles coarse cookie crumbs, add a few tablespoons of the cold water. Mix together until the dough sticks together when pressed. The dough should be moist but not wet. Flatten dough into a disk, wrap in plastic wrap and chill for at least 1 hour before rolling. On a lightly floured surface, roll out dough to 1/4″. Cut out an equal amount of small and slightly larger circles. This should produce enough for about 9 pies. Then if you roll out the scraps of dough, you can get another 2 circles of each. Yes, you most certainly can reuse the scraps once to get more circles. That is how I got so many out of such a small amount of dough. 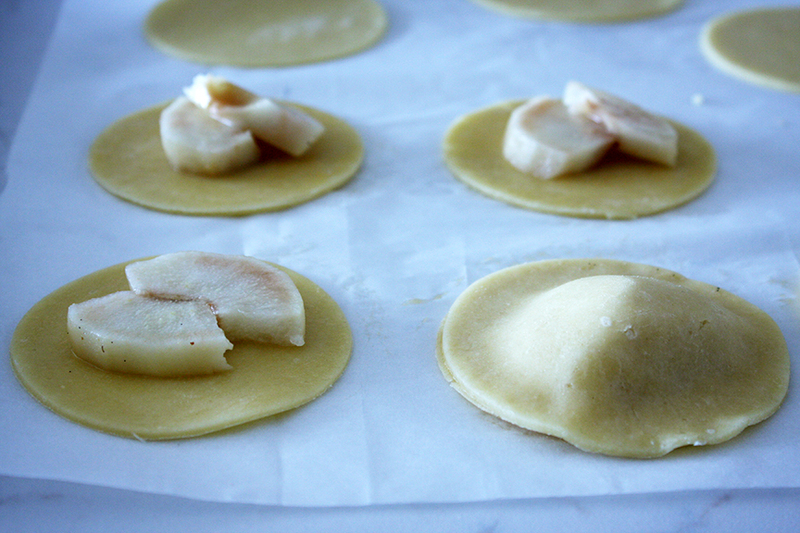 Reusing the scraps more than once will made the dough too tough. Lay the circles out on a parchment-lined sheet, in layers if needed, and chill until ready to assemble pies. In a small-ish sauce pot with high sides, combine all poaching liquid ingredients except for the lemon. Bring to boil, whisking frequently to dissolve the sugar. 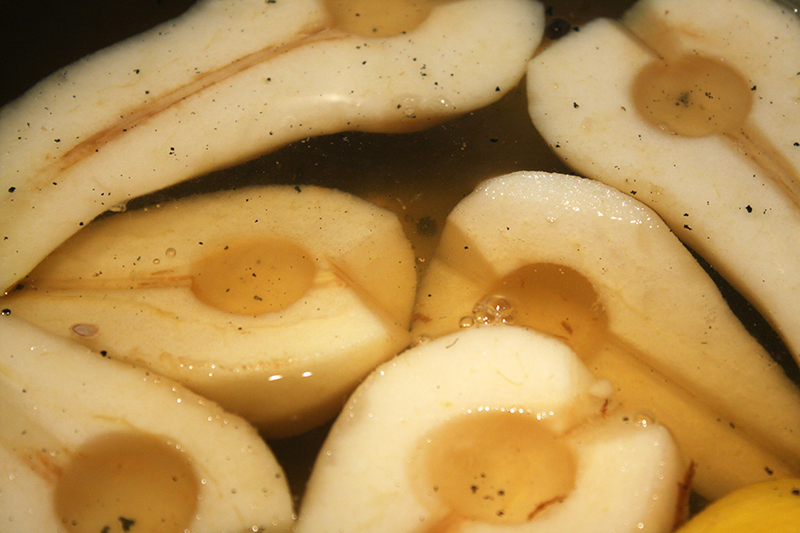 While the liquid is simmering, peel and core the pears. I also like to remove the fibrous inner rib that runs from the stem to core. To remove this, take a paring knife and cut inward on an angle along either side of the rib then peel it out. Once liquid comes to a boil and all sugar is dissolved, squeeze the lemon to release the juice into the pot then throw in the lemon. Place 2 halves of 1 pear core side up in the pot. Remove from heat, cover the pot and let stand for 5 minutes. Remove the pears and let cool. The pears should be tender on the outside, but still a bit firm in the center. Repeat with remaining pear. If you want to do all pears at once, it’s best to use a larger pot and double the poaching liquid. 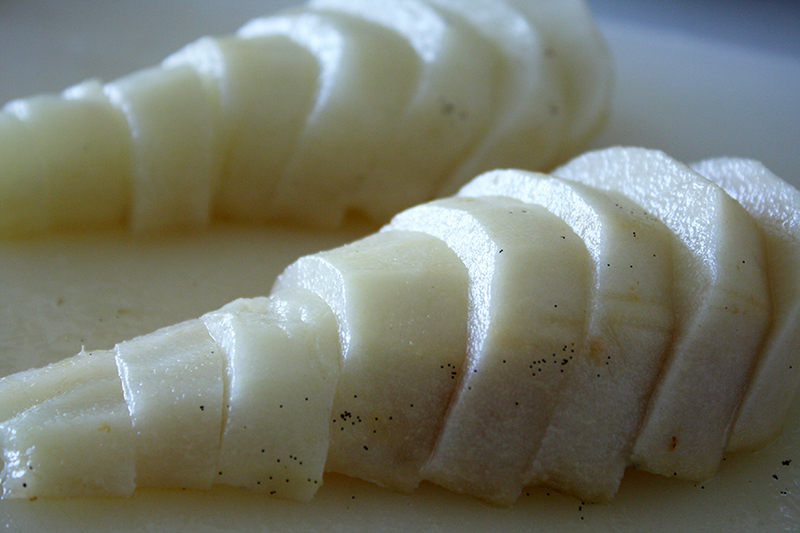 Once pears are cool, slice them into 3/4″ thick pieces. 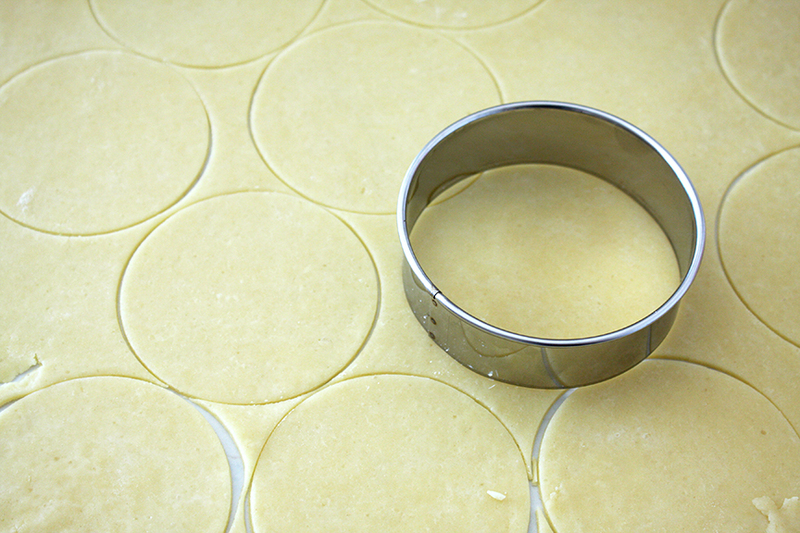 Remove the pastry circles from the refrigerator and let them sit for 5 minutes. If they are too cold, the dough will crack when you try to mold the top circle onto each pie. Prepare the egg wash. Whisk together egg, egg yolk, a splash of water and a sprinkle of salt and sugar. Brush a small amount of egg wash around the rim of each of the small circles. Place a couple of pear pieces in the center of each circle. Place a large dough circle on top of the pears and gently press around the edges to seal. Repeat with remaining pies. Using a fork, finger, fancy pie crimping tool or spoon handle (as I do), press down around the rim again for extra sealing. Make a small slit at the top of each pie so the steam can release during baking. Chill pies for 10 minutes while the oven preheats. Preheat oven to 375F (190C). Once pies are chilled, brush top of each pie with egg wash. Sprinkle with sugar. Bake pies for 20m or until golden brown. You may need to bake them in two batches depending on the size of your oven and cookie sheet.